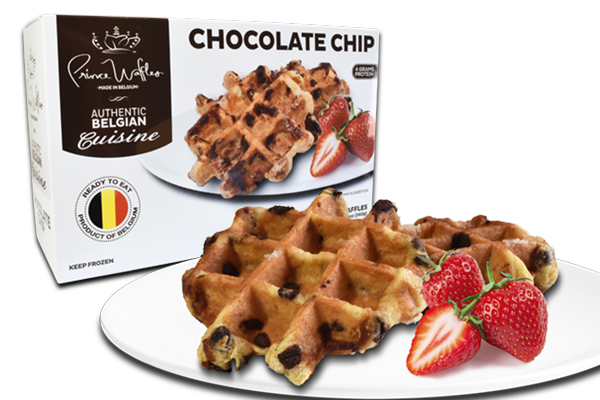 Enjoy the sweet and yeasty taste of a classic liege waffle with an added decadent bonus of real Belgian chocolate chips. Our Chocolate Chip liege waffles are pure perfection all by themselves. They don’t even need syrup—or a plate! You can also serve them with fresh blueberries for an extra kick. Or indulge your sweet tooth by drizzling them with gooey hot fudge. Top it all off with a pile of fluffy whipped cream and your family will be unable to resist. What else could you do with a waffle that’s one up on the classic chocolate chip cookie? You’ve heard of a cookie sandwich—well, how about a waffle sandwich with a layer of vanilla ice cream in between? Sneak some bananas in there and you have almost all the major food groups covered. Top it with whipped cream, cherries, and walnuts. You can even toss on some sprinkles if you’re feeling festive. Serve with a tall glass of chocolate milk. Or a tall glass of Cabernet if you’re feeling weekend-ish. Cha-cha chocolate chip. Waffles can be heated from frozen or thawed. Always remove wrapper before heating. Do not remove wrapper and leave waffles at room temperature for up to 2 hours or in refrigerator for up to 12 hours. In Microwave: Remove wrapper and microwave for up to 15 seconds or until slightly soft. Preheat oven to 400° farenheit for 10 minutes. Waffles from frozen: Place frozen waffles on a cookie sheet in oven for 5-6 minutes. Allow waffles to cool before eating. Waffles from thawed: Place thawed waffles on a cookie sheet in oven for 3-4 minutes. Allow waffles to cool before eating. Waffles from thawed: Place thawed waffles in toaster at medium-high heat for approximately 2 minutes. Allow waffles to cool before eating. Thaw according to above. Eat waffles within 8 hours of thawing for best flavor. Heating times may vary depending on oven or toaster wattage and may need to be adjusted. Keep frozen or up to 3 days in the refrigerator after thawing. Do not re-freeze waffles after thawing. Powder, Soy Protein, Lactose, Dextrose), Soy Milk Powder, Natural Vanilla Flavor.